Seattle is one of the largest Uber & Lyft markets in the United States, having both launched in the area over five years ago. Seattle is an ideal town for driving Uber and Lyft. In fact, more than 1,000 people are moving to Seattle weekly, and the city’s natural geography means a lot of people need to get around. Below are some helpful tips on how to get the most rides, give the best service, and make the most money while you’re online! Other notable areas include Greenwood, Green Lake, First Hill, West Seattle, Beacon Hill, and Columbia CIty. The Eastside (a substantial section of the greater Seattle area that lies east of Lake Washington) also sees consistent demand. However, the lake and the two sole bridges that connect the Eastside to Seattle mean that drivers will usually work one of those regions or the other at a time. Of course, passengers will often seek transport from one side of the lake to the other, meaning good fares for drivers. Some notable neighborhoods on the Eastside include Bellevue (Bellevue Square Mall), Kirkland, Redmond (Microsoft Campus), and Factoria (Factoria Mall). Demand in most of these Seattle-based areas will fluctuate throughout the day. Residential neighborhoods will be busy during rush hour in the mornings and evenings, but bars and restaurants will see increased demand in other areas at night. Because Safeco Field and Centurylink are both located in Pioneer Square, that area is always hot after sports games and other stadium events like concerts. In general, if you are starting in the Downtown or Capitol Hill area, you are guaranteed to score a ride immediately, which may take you 5 to 30 minutes or more, anywhere in the vicinity. As a rule of thumb, it’s a good idea to always head back toward a busier city center, as residential areas are lower in ride request frequency. A good idea to obtain ride requets going to Sea-Tac airport is to wait around business centers during the day – Amazon campus in South Lake Union, Microsoft campus in Redmond, and the many offices in downtown Bellevue see mutliple business people heading to the airport throughout the day. During mornings, residents will be heading from surrounding residential areas into Downtown, South Lake Union, and across the lake to the Eastside to get to work. During the late morning and afternoon, drivers will pick up people running errands, and the lunch crowd. In the evenings, residents will disperse from the business centers back out across the greater Seattle area, then head back out to Belltown and Capitol Hill at night. In spite of being a large metropolitan area, Seattle is a very close-knit community. Residents will often be on the same wavelength about whatever event, holiday, concert, sports game, etc. is happening on a particular weekend. As such, it’s in drivers’ best interests, here in Seattle even more than in other cities, to research the city’s event calendar thoroughly and work during event times. While in a city like Los Angeles, where there is always something going on every night of the week, Seattle is still a bit more modest with its nightlife offerings. Of course, this means that an event like a Seahawks Game will inevitably bring out much of the city’s population at once. While drivers can choose to drive either Lyft or Uber in Seattle, most prefer to drive both to maximize earnings while behind the wheel. During busy times, drivers can easiliy make $25 – $30+/hr driving people between neighborhoods and to and from events. During other times (and when you’re first starting out), drivers can still expect hourly earnings in the $15 – $20 per hour range. Acquainting yourself with the city well enough to learn shortcuts, avoid traffic, and make the most of your time, will result in higher earnings. Seattle traffic is an interesting creature. The population increase over the past decade has certainly worsened the problem, but for now it is still fairly limited to predictable times of day. Morning and evening rush hour will put you in stop-and-go (or motionless) traffic on certain major thoroughfares throughout the city, such as 1st Ave, 5th Ave, Denny Way, South Lake Union, and any streets nearby a highway entrance or exit. However, rush hour tends to end promptly around 6 – 6:30 pm, and traffic dies down considerably after these times, whereas in a larger city (such as LA), congestion might be a round-the-clock occurrence. Using the Waze app for navigation is imperative to staying on top of Seattle’s landscape of unpredictable traffic, and ever-changing street-level construction closures. It’s also a great idea to give your passenger the choice at the outset of the ride to either give you directions, or let you follow Waze. This will effectively relieve you of any blame from your passenger should you run into traffic during your ride. The Aurora/99 highway is a great alternative to the often congested I-5 (whether you’re headed south to the airport, or the opposite direction toward North Seattle). The Aurora also runs north and south and lies only a mile or so west of the interstate. Take heed however – the Aurora highway is old, and ramps to the highway are often poorly marked and sporadic. So, do your homework and learn your entrances and exits before navigating this tricky highway. All drivers are allowed to drop passengers off at the airport. However, the for-hire permit (that all Seatle-area drivers are required by the city to hold, and which Uber and Lyft will apply for on your behalf) allows drivers to specifically *pick up* passengers from the airport. Uber and Lyft Drivers queue up at Ground Transportation Staging Lot located at 3069 S. 160th St, Sea-Tac WA 98188. Qualified Lyft & Uber drivers picking up passengers from the airport should also remember to always display their trade dress, for-hire windshield sticker, and in-cabin for-hire permit when entering the Lyfft/Uber pick-up area. Lyft and Uber are almost equally busy in the Seattle area. Drivers who are smart about where and when they drive can earn an average of $20 to $25 or more an hour. That number only increases for drivers who are driving full-time and are taking advantage of Lyft’s weekly “Power Driver” bonus. Signing up for both apps is best, especially because the application process and documents required for both apps is almost identical. Lyft and Uber both accept each other’s previously completed vehicle inspection forms, as long as the form completed is in the city’s standard “FAS” format. Uber has more request volume and brand recognition. 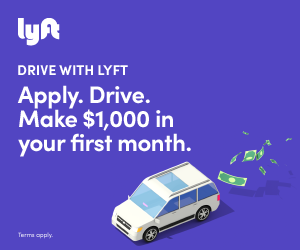 But Lyft consistently scores better with driver approval, passenger tip frequency, and weekly bonus earning offerings. If you currently drive in Seattle and have any local tips for other drivers, please share in the comments below! Doordash Driver Jobs - Should You Sign Up?